This is a big bowl of comfort. There are few things better than a stew of some sort, dense with vegetables and meat, warming you from the inside out. Although stews are considered winter fare, I enjoy them year round. Especially when made in the slow cooker, because it does not make my kitchen hot and steamy in the summer. 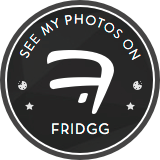 Usually I develop all the recipes you see on this blog. Today’s recipe, while not a straight out copy, is more than influenced by this Pressure Cooker Thai Green Curry I found on SeriousEats.com. I used a container of Ironman Spinach Beet Salad that I received a sample of from Cut ‘N Clean Greens. You can use almost any type of dark leafy green in this stew, from spinach to kale. 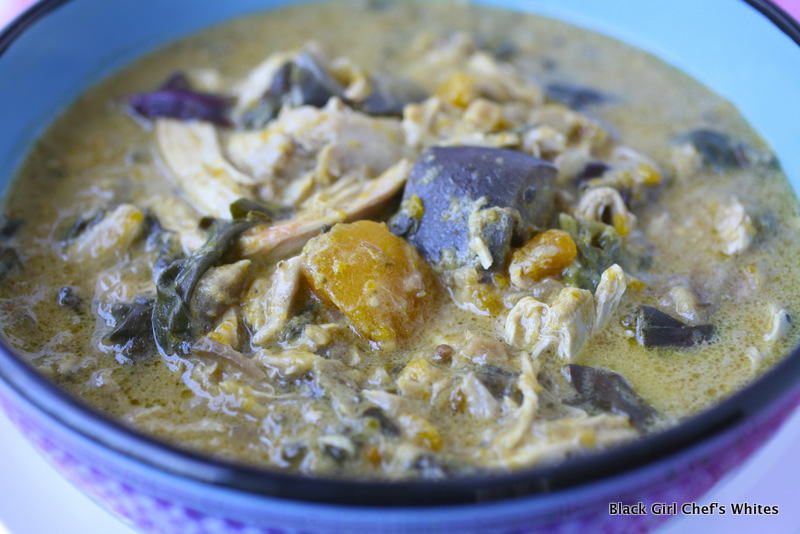 The flavors meld so beautifully in this curry, the sweet squash, bitter greens and eggplant, creamy coconut milk infused broth. The chicken so tender it melts in your mouth. In a medium skillet heat the coconut oil over medium high heat. Cook the garlic, ginger, coriander and cumin 1 minute, or until fragrant. Add the green curry, cook 1-2 minutes, stirring occasionally. Add coconut milk, water and kaffir lime leaves, bring to a simmer. 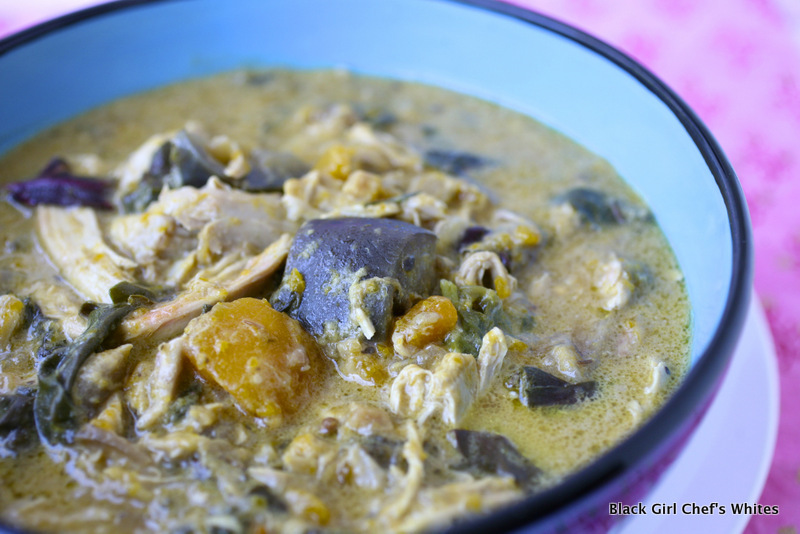 Place the chicken, squash, eggplant into slow cooker. Season the ingredients in the slow cooker with salt to taste. Pour the seasoned hot coconut milk over the chicken and vegetables. Cook on high for 5 hours in the slow cooker. Dried Kaffir lime leaves can be bought online or found at Asian markets. The IronMan Spinach Beet Salad I used is from Cut 'N Clean Greens. If you cannot find this product in your supermarket produce aisle, you can substitute with baby spinach, chard or kale. What a wonderful, comforting recipe you devised! All those flavors, playing against each other. We can imagine how tasty this dinner was. And you’re right…it looks like it would take well to any dark greens. We’re also thinking of mustard greens or turnip greens, for even more zip and zing! 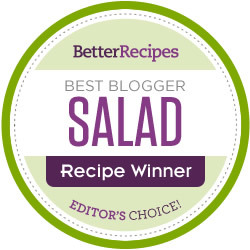 Thanks for a great recipe featuring our greens blend. Believe it or not, I have never made a curry in my slow cooker. I am going to do this recipe as my inaugural turn!